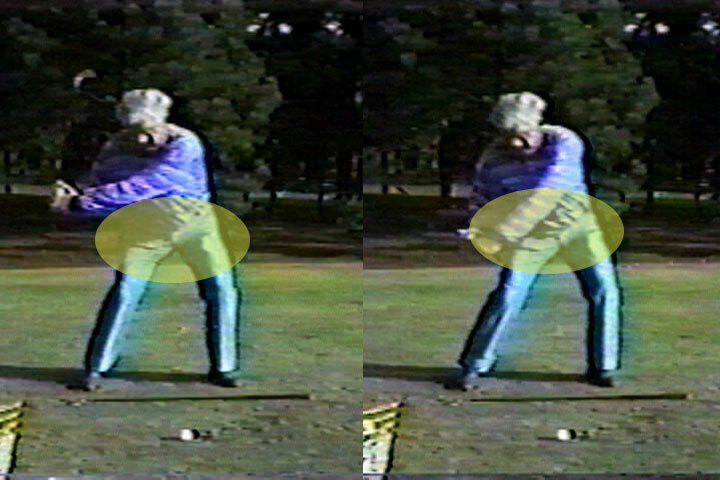 Many people, who have been swinging like Moe Norman – have been commenting on our recent webinar regarding the sequence of the downswing. Some have found this information to be extremely valuable as this movement relates to the initiation and the start of the downswing. GGA has always established that, even though the arms are the reason for all movement in the golf swing, there is a sequence of events that occur to allow the arms to be independent of the lower body. This “independence” means that the lower body can move – without the upper body. This establishes the stabilization for the upper body and the proper position of the arm movement. Let’s take a look at a few comments Moe made regarding the downswing. Moe called his downswing the vertical drop. 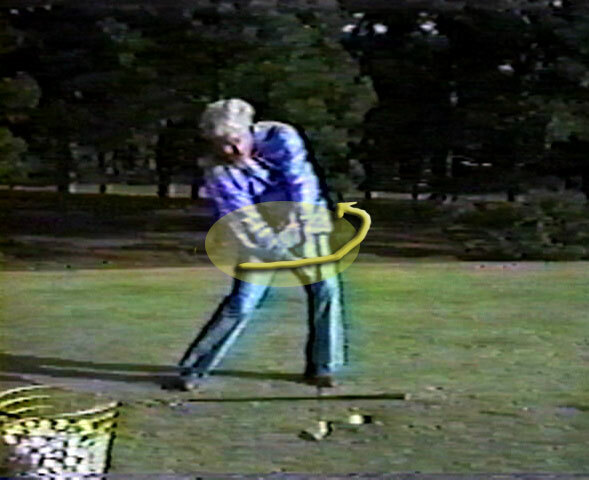 This, as he referred to it, was his interpretation of the movement of the golf club in the downswing. 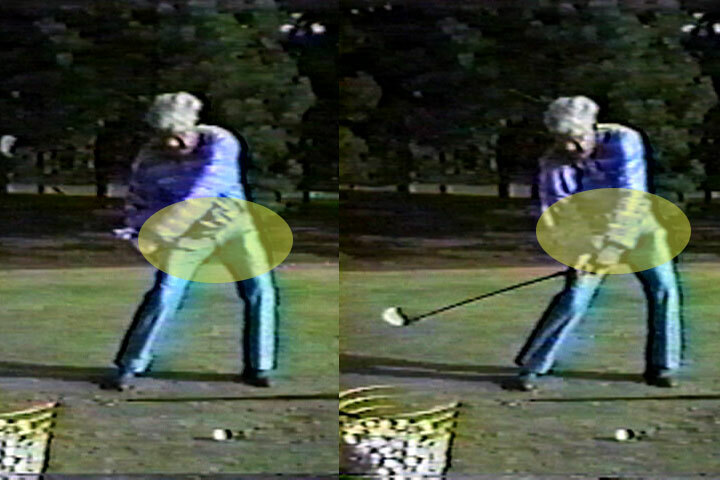 Moe also said that he would begin his downswing before the completion of his backswing. And finally, Moe talked about his lower body movement calling the sequence “Buckle, Sit, Slide and Bump. I will review these feelings, comments and instruct you how to accomplish the proper downswing sequence in this article. First, you must understand that when it comes to the downswing sequence, I consider the information here advanced instruction. What I mean by advanced is not that only highly developed players should know this information, what I mean is that if your grip, address and backswing are not correct – this information most likely will not help you. Therefore, those who have great fundamentals and are correctly making a backswing on plane – you will benefit the most from this information. If you are still working on the basics of grip, address and backswing, absorb this information and it will be much more useful as your back-swing plane improves. Moe’s comment, “I swing back as I come down” in combination with the vertical drop are all a part of the proper sequence of the golf swing. What does the lower body do to accommodate this sequence of events? The answer is stabilize. So what does stabilize mean – exactly? 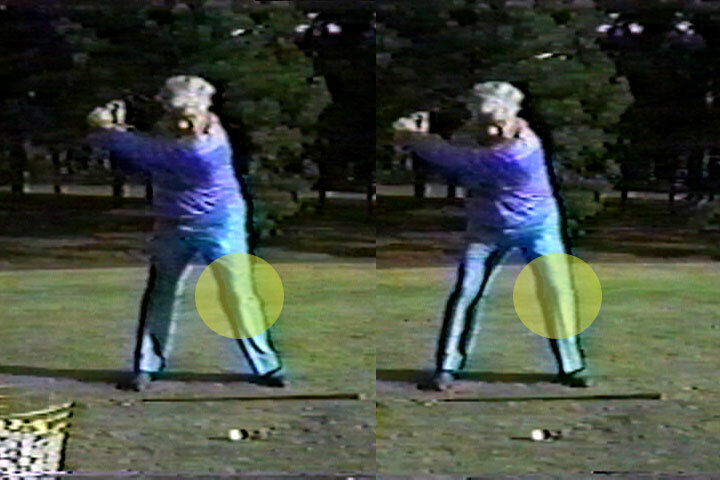 Moe described the lower body action as Buckle, Sit, Slide and Bump (BSSB) – terms he most likely learned from Paul Bertholy – one of Moe’s mentors. My interpretation of the Buckle-Sit- Slide-Bump is that it is the sequence of the lower body’s action when striking a golf ball. This sequence happens simultaneously where the knees buckle toward the target, the body sits down as the weight moves to the lead foot (slide) and the hips slightly rotate which Moe referred to as the bump (which is where impact occurs). Moe referred to this motion as “stabilizing the platform” where the lower body stabilizes the platform for the upper body. To get into a bit more detail about his movement, you must discuss hip rotation during this sequence. Here is some video of the movement of Moe’s lower body from behind. As you know from practicing the backswing, the hips rotate in the backswing and then re-rotate in the downswing as the knees move toward the target (the lead knee moves toward the slightly outward turned lead foot). This re-rotation, movement to the lead foot and knee flex creates the ideally stabilized lower body. What must be noted is that the flex in the lead knee keeps the lead hip area stationary while the trail hip rotates inward. Further examination, an from our instruction of lower body movement, shows that if you keep your lead knee moving toward the toe and the trail foot down, you can rotate (bump) without over rotating. This is a powerful move and one that requires a perfect backswing plane. Don’t forget that the lower body sequence ideally positions the spine which the foundation for shoulder and arm movement. This move requires that the upper body and lower body can act independently of each other. In other words, the upper body can not be in sequence with the lower body. The lower body must separate its movement in the downswing to allow the upper body to independently move the golf club – vertically drop, lag and the arms to move correctly into impact. If you are planning on running to the range to work on BSSB, please do not try to Buckle, Sit, Slide and Bump in that order as you make a downswing hitting golf balls. The way you can work on this movement is to master the total move, independent of the arm movement and then put this newly learned movement together with the independent arm motion. 4) Beginning with your lead knee, altogether move the lead knee toward the toe as both knees flex and rotate your hips. 5) Allow your shoulders to move back to square at impact where the arms are once again in front of you. 6) Maintain you spine tilt at all times. Once you have mastered the independent feeling of the lower body, you can grab a club and beginning timing the upper body movement with the beginning lower body movement. As I said earlier, this is a critical but advanced movement – one that can be extremely beneficial to those who are ready for it and devastatingly difficult for those who are not. If you think you are one of those who is not ready for this move, start by doing the drill above and continue to work on your swing plane. Eventually, all of your swing sequence will come together – independently. Furthermore, the Internet golf academy is GGA’s best way to keep you on track when working on this movement or any other part of your golf swing. Start sending in videos TODAY! Call Scott for more information.